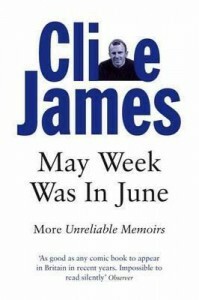 May Week Was in June, Clive James, Mac Millan General Books, 1991, ISBN 9780330315227, 245pp. This third volume of unreliable memoirs picks up where the previous volume (Falling Towards England) let off. James, in these books, is interesting, yet not as funny, at least to me, as it seems the things he is describing should be. I definitely need to give his fiction a try. The nice thing about reading a writer’s biography like this is to realize that you are not alone. It is much too easy for me to think that I am the only one with trouble concentrating on the matter at hand instead of flirting with one passion after the other.